Evidence for a Young World : NOT! 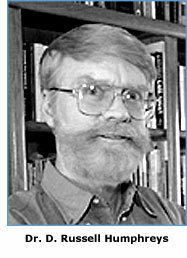 New Mexico is home to creation physicist D. Russell Humphreys. On Monday, February 13th, 2006, "creation physicist" Russell Humphreys gave a talk at Sandia National Labs. Here's a report from a Sandian who attended. I attended an event today in the Steve Schiff Auditorium that should not have taken place. The event was titled "Evidence for a Young Earth" and was sponsored by a group here at Sandia called "Christians in the Workplace Networking Group." The presenter's name is Russell Humphreys, an avowed creationist and apparently a retired Sandian. Mr. Humphreys spent the first ten minutes of his presentation describing why the Bible is the word of God and should therefore be the source of scientific conclusions regarding the creation and age of the earth and universe. There were also various pamplets, books, and videotapes for sale in the lobby. I purchased a book titled, "The Answers" for $13.00. The lobby of the Steve Schiff Auditorium is not an appropriate place for the merchandising of this man's publications. This should stop. The content of his presentation, while scurrilous in its rebuttal of mainstream science, is not the point of my objection. As recent judicial commentary has said, biblical creationism, and its cohorts Intelligent Design and Young Earthism, is based on a religious philosophy. It goes against Sandia's charter and policies to facilitate the presentation of a specific religious point of view. These presentations should be held off campus, not in tax payer funded facilities. This group is planning future events of this nature, specifically March 13. I hope Sandia will take action to cancel these events and encourage the sponsors to find an appropriate venue elsewhere. To this day, Humphreys has not corrected egregious errors in his pamphlet that have been made known to him for a decade! A PDF version with graphics is located here. The version distributed at the Feb. 13th, 2006 Sandia Labs talk is on-line here. To this day, Humphreys has not corrected egregious errors in his claims that have been made known to him for a decade! Humphreys has been handing out a small tract titled "Evidence for a Young World" since 1995 at least. His tract was the subject of an article in the very first NMSR Reports, in February 1995. Over the years the tract has incorporated glossy photographs and a few new arguments, but it's mostly the same old schlock. What Humphreys said 11 years ago at Hoffmantown Baptist Church was wrong. What Humphreys said this February at Sandia Labs was still wrong. But it's not just that his physics is abysmal and incorrect - his continued physical abuses of science are just plain wrong. If he was only confident enough in the Bible to say he believes the Earth is young because the Good Book says so, and leave it at that, I wouldn't have any quarrel with the man. But the Bible isn't enough, and Humphreys is compelled to twist good science into an unrecognizable monster in order to claim justification of his views. It's bad enough that he misinforms the public about science at church meetings and creation seminars - now, he's peddling his snake oil at Sandia National Labs, under the mantle of the group "Christians Networking in the Workplace." According to evolutionary theory, comets are supposed to be the same age as the solar system, about five billion years. Yet each time a comet orbits close to the sun, it loses so much of its material that it could not survive much longer than about 100,000 years. Many comets have typical ages of less than 10,000 years.4 Evolutionists explain this discrepancy by assuming that (a) comets come from an unobserved spherical Oort cloud well beyond the orbit of Pluto, (b) improbable gravitational interactions with infrequently passing stars often knock comets into the solar system, and (c) other improbable interactions with planets slow down the incoming comets often enough to account for the hundreds of comets observed.5 So far, none of these assumptions has been substantiated either by observations or realistic calculations. Lately, there has been much talk of the Kuiper Belt, a disc of supposed comet sources lying in the plane of the solar system just outside the orbit of Pluto. Some asteroid-sized bodies of ice exist in that location, but they do not solve the evolutionists problem, since according to evolutionary theory, the Kuiper Belt would quickly become exhausted if there were no Oort cloud to supply it. Refs: 4. Steidl, P. F., Planets, comets, and asteroids, Design and Origins in Astronomy, pp. 73106, G. Mulfinger, ed., Creation Research Society Books (1983), order from http://www.creationresearch.org/. Comets disintegrate too quickly (maximum age: 100,000 years). Humphreys notes that comets lose some mass with every trip around the sun, claims that there is no source of new comets in the solar system, and then concludes that comet lifetimes (10 to 100 thousand years) provide an upper limit to the age of the solar system. But Humphreys' comet theory fell apart recently because a source for new comets, the Kuiper Belt (predicted by astronomer Gerard Kuiper in 1951), has been actually photographed and confirmed by several teams of astronomers. Humphreys responds to these discoveries by saying that the supposed "Kuyper Belt" [sic] doesn't help scientists because it must be supplied by the unproven Oort Cloud; and that even if what he calls the "Kuyper Belt" existed, it would exhaust itself of comets in a short time (say, a million years). But he has his astronomy backwards - the Kuiper Belt contains the remains of the "volatile" (icy) planetesimals that were left over from the formation of the solar system - numbering in the hundreds of millions. If anything, it is the Kuiper Belt that supplies the more remote Oort Cloud, as some icy chunks are occasionally flung far away by interactions with large planets. There is a source for new comets, and the fact that we still see comets does not prove the solar system is young. In the eight years since, Humphreys has learned that "Kuyper" is really spelled "Kuiper." That is all he has learned - his astronomy knowledge is still abysmal. The Kuiper Belt is no longer a "supposed" source of comets, it is a documented source, with over 800 Kuiper Belt Objects discovered since 1992 (Wikipedia). ... Most Oort cloud comets are believed to have formed in the region of the giant planets (1, 31), whereas JFCs [Jupiter Family Comets] are thought to have formed in the Kuiper belt beyond the giant planets (3234). However, recent simulations of Oort cloud formation (35) suggest that ~30% of the present-day Oort cloud originated in the Kuiper belt (although most of these objects left the Kuiper belt a long time ago). Recap: Humphreys says that if the solar system were really billions of years old, there wouldn't be any comets left around. He dismisses one possible source of new comets, the Oort cloud, as "unobserved," and dismisses another source, the Kuiper Belt, as having to be supplied by the unobserved Oort cloud, and therefore "unobserved" itself. For a decade, Humphreys has ignored numerous sightings of actual Kuiper Belt objects, and has also disregarded evidence that the Kuiper Belt supplies the Oort Cloud, not the other way around (as Humphreys claims), even when that evidence is cited in his own handouts! This is terrible science. If Humphreys submitted his work as a high school Science Fair project, suffice it to say he wouldn't be going on to the Regionals, much less the State Science Fair. CHECK IT OUT FOR YOURSELF! "...helium produced in zircon crystals in deep, hot preCambrian granitic rock has not had time to escape. Though the rocks contain 1.5 billion years worth of nuclear decay products, newly-measured rates of helium loss from zircon show that the helium has been leaking for only 6,000 (± 2000) years. This is not only evidence for the youth of the earth, but also for episodes of greatly accelerated decay rates of long half-life nuclei within thousands of years ago, compressing radioisotope timescales enormously. ..."
"Re helium diffusion, your helium diffusion experiments were performed in vacuum, not the 200 to 1200 bars [e.g. over 1000 times more pressure than the normal atmospheric pressure of 14.7 pounds per square inch] actually found below the surface of Fenton Hill [where Humphreys' zircons were gathered]. Why are you impressed that your helium diffusion "age" is orders of magnitude smaller than the real age of the earth, when the physical pressures are also orders of magnitude different? Did you know that even blood boils in outer space?" Humphreys also discussed how he and his fellow creation scientists have been finding radiocarbon in diamonds, regarded as far too old (billions of years) to have any amount of fast-decaying radiocarbon left in them. In this regard, I had contacted Dr. R. E. Taylor, of the Department of Anthropology at University of California, Riverside, and the Keck Laboratory for Accelerator Mass Spectrometry at University of California, Irvine. Taylor is a serious radiometrics scientist. Like Humphreys, he also looks for radiocarbon in diamonds, but Taylor does so as a way to monitor instrument background and noise. Diamonds are so old, they shouldn't have any residual radiocarbon (C14 decays with a half-life of under 6,000 years), and indeed, they don't. So diamonds are as close to a carbon-containing C14 "blank" as scientifically possible. The abstract that got me talking to Taylor is called "Use of Natural Diamonds to Monitor Radiocarbon AMS Instrument Backgrounds." I contacted Dr. Taylor late last year, and inquired about the creationist group's misuse of radiocarbon methods. My take on their problem is that they [RATE creationists] apparently have little or no understanding of operational details involved in AMS technology and the nature of how ion sources and AMS spectrometers work since, as far as I know, none of these people have any direct research experience in this field. They are thus not aware of the many potential sources of trace amounts of radiocarbon in the blanks and how a detector can register the presence of a few mass 14 events that are not radiocarbon. When creationists crow about radiocarbon in diamonds proving that the diamonds are only thousands of years old, you can remind them that they're just measuring noise in an atomic mass spectrometer! What about Carbon-14 in Coal Deposits? See this article by Kathleen Hunt (May 22, 2002). Many more interesting articles from CESE are found here. Find out WHERE the missing helium goes!